The base of this tree with its roots exposed by shifting sand looks like it is running away. We have arrived at our Winter home at Picacho Peak Arizona. It is always an adventure to choose a place to stay when you have never been to an area before but we are very happy with our choice. Picacho Peak RV Resort is a lovely friendly park with a lot of amenities and active Winter residents. There is plenty of room to walk and ride bikes. Fred has met a group of Pickleballers and I am already in with the Crafty ladies. Its going to be a fun few months. We are settled in and have been busy planning for the Holidays. I finally am getting around to recording our last few stops in New Mexico and Arizona before arriving here on December 1. The few we looked out on at White Sands Missile Range RV Park. We had an opportunity to stay at New Mexico's White Sands Missile Range Army Base in mid-November. Their RV Park is only 8 sites and we were lucky to be able to claim one for a week. The pads were situated to have a lovely view of Salinas Peak and the San Andres Mountains. White Sands Missile Range is right up the road from White Sands National Monument, another of our National Treasures administered by the National Park Service. It is like no other part of the desert that we have seen. The sands of the Tularosa Basin in this part of the Chihuahuan Desert are a brilliant white in color. From a distance the dunes look like snow drifts. The sand here is gypsum and it is cool on your feet making it pleasant to walk in. A shallow seeping water supply beneath the sand supports a small but diverse ecosystem that is not found anywhere else on earth. The sands are always moving changing the shape of the dunes. Plants have learned to grow tall quickly and to dig in their roots. Animals have adapted by evolving into light colored versions of their species. Fred walking across the sand. 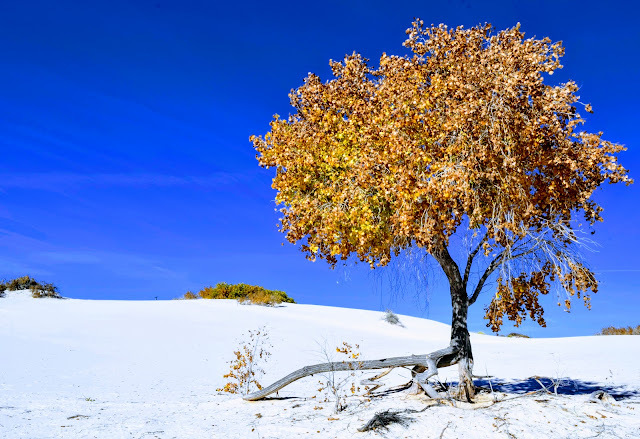 Visiting White Sands is like going to the beach, without an ocean nearby. Family's picnic here with sun shades and beach blankets and barbecue equipment. There are Volley Ball nets set up and several groups of people had brought in waxed sleds to slide down the dunes. We took a short hike through the dune life nature trail, walked a boardwalk over and between the dunes and enjoyed a picnic lunch. It was a lovely way to spend the afternoon. We enjoyed the adobe architecture and decorative doors of Las Cruces. White Sands is not far from Las Cruces, New Mexico. We drove into the historic city twice in order to explore. Our first visit was to attend the Saturday Farmers Market. The Market turned out to be more craft fair than produce market but we did see a great Veterans Day Parade that included marching bands, representatives from all branches of the Military, local Police, Fire, EMS and Border Patrol. It was quite a spectacle and we were glad to have happened upon it. Billy the Kid was convicted of murder and sentenced to hang but escaped after being transferred from Mesilla. Our second visit to Las Cruces was to the Old Mesilla District. We enjoyed seeing all of the historic adobe houses with stone fences guarding their gardens. Old Mesilla was part of the Wild West. Here at one corner of the Plaza Billy the Kid was jailed while waiting for trial. The old jail is a gift shop that serves delicious coffee now. Francisco Pancho Villa walked these streets. Pat Garrett, the man who killed Billy the Kid, is buried here. Opposite the old jail is La Posta de Mesilla a restaurant that was once a stop on the Butterfield Stagecoach Line. The old adobe building once provided rooms for sleeping, a blacksmith shop and a stable for horses in addition to food service. We enjoyed a great lunch of traditional southwest foods while watching restaurant employees decorate for Christmas. The restaurant has a large display of caged parrots and piranha in tanks near the entrance. It was unexpected and delightful. Thanks for the recommendation Mike and Connie Johnson! The other historic buildings around the Plaza house restaurants and gift shops that feature products from the Southwest and Mexico. Some of the buildings are adobe, others were brick and one had decorative tin siding. We enjoyed looking at all of the woven rugs and blankets whose designs are specific to individuals or families. We left White Sands Missile Range on Friday morning and were thrilled to see a missile test on that last day. I was out walking and Fred was at the RV talking with our neighbor when we each observed the missile streak through the sky and land in a puff of smoke. The sound and a contrail followed a few seconds later. It was an amazing display that we were glad to have seen. US-70 and the access road to the base close during the tests so we were a captive audience for the rest of the testing that morning. Happily we only had to travel about 60 miles to our next destination. Great post, Bonnie! We really enjoyed that area, as it is so unique! How cool that you saw that missile test! We were really happy that our detour allowed us to spend so March time in New Mexico. There are so many beautiful things to see.